Since the reunification of Germany the town on the edge of the Mecklenburg Lake District is once again the capital of Mecklenburg-Vorpommern. With its renovated old town and the attractive surrounding countryside with over 70 lakes Schwerin attracts many visitors. Landmark and a magnet for visitors is the castle of the dukes of Mecklenburg which was built in the 19th century along the lines of Loire Castle of Chambord. Because of its location on an island which is transformed into an English park, it is like a fairy tale castle. 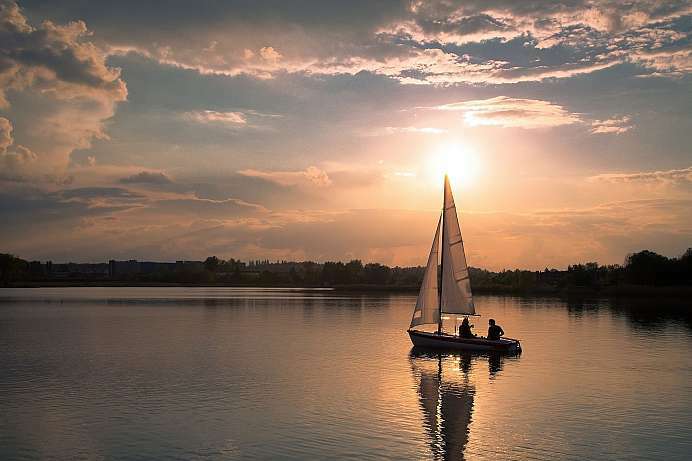 The second largest lake of Mecklenburg is almost 25 kilometers long and five kilometers wide. Since 1842 it is halfway separated by the causeway of the national road B104 leads in east-west direction. Lake Schwerin is shared by sailors, swimmers, surfers and white passenger ships that connect Schwerin with the south of the lake. The small islands – such as Kaninchenwerder – are all under protection. Hiking trails follow the wooded shores. Especially beautiful is the French way, which begins in the castle park of Schwerin and leads to the south.